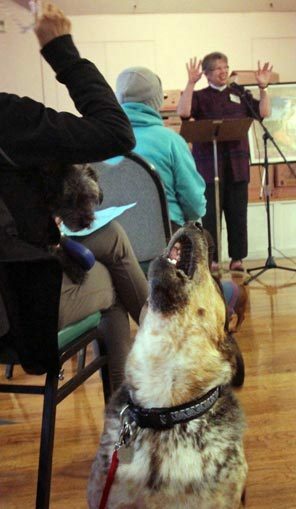 Seattle church launches church service for pets! The cats no doubt had their own weekend stuff to do, like extended napping. The fish probably didn’t relish a car ride. But the dogs, ever sociable, showed up with enthusiasm at Immanuel Lutheran Church in South Lake Union Saturday morning. “Welcome, whether you have two legs or four legs,” began Pastor Susan Burchfield, her clerical collar just visible above a purple tunic, as she introduced a short service called the Blessing of the Animals. The pet owners at the service, just over 40 people, added cheerful animal noises to the prayer responses as Pastor Burchfield went through a litany of praise that began with pets and broadened inclusively as the prayer continued. By then, the humans didn’t need to add any animal sounds as, perhaps prompted by images of squirrels, the dogs began to bark. I think I can interprete what the pets were thinking – Jesus I know, Paul I know but who are you? What a “hare-brained” idea. No wonder the Bible says women should not be in the pulpit!